A friend of mine had a very recent and unpleasant experience. He wanted to format an USB stick, picked the wrong drive letter and formatted his encrypted USB flash drive instead. All data gone without a chance to restore them as he did not have a recovery option. This is probably an extreme scenario but there are many cases where documents and files can become unavailable including hard drive failures, computer virus attacks or human error. The document management software DocShield has been designed to protect the most important documents from these kind of errors. It looks like a backup software on first glance but it is actually more than that. 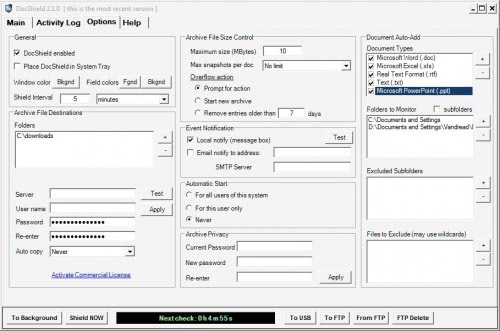 DocShield can monitor document file types like doc, xls or txt in multiple directories that are available on a specific computer system. It is highly flexible and offers the possibility to add file extensions that should be monitored to the interface. The main window offers the additional option to add single documents or groups of documents from a folder to the document management program. These directories are monitored in intervals and document snapshots are created whenever the document change. These snapshots can be stored in multiple locations and packed to save storage space. A password can be assigned to secure the document archives. The number of snapshots and a maximum file size per document archive with options to prompt for action if the limits are reached can be defined in the settings of Doc Shield as well. Event notifications either come in the form of a message box or email if a SMTP server is configured by the user. One interesting option is to automatically copy these document backups to a ftp server. Data can be moved manually to an USB device which will not only copy the documents but also a portable viewer that can be used to view archive contents and open documents. The document management system offers an extensive log and overview of all the documents that have been backed up in the past. These documents can be opened or extracted to the local computer system. DocShield can protect documents. The option to automatically move the backups to a server and the USB viewer make it an excellent tool for many occasions. The document management software is compatible with most Microsoft operating systems including Windows XP and Windows Vista. It requires the Microsoft .net Framework 2.0 and is free for personal use. nice find. I’m trying it now. for some reason the application will not minimize to the tray so it takes up real-estate from the taskbar, which is annoying. also, you cannot set the interval for the snapshot. it seems to be set for a default of making a backup every 5 minutes. i would like it to be every minute. apart from that seems very easy to use. Is there any method of recovering data from usb drive which has been encrypted by bitlocker? Unfortunately, the above extreme situation is what happened with me and have lost about 360 GB of data from my 500 GB usb drive :( Is there any way out?